The LEEA, otherwise known as the Lifting Equipment Engineers Association, recently completed its first batch of on-site audits at a number of prospective member companies based in China. The companies included H-Lift Industries Co. Ltd (based in Shanghai), General Lifting Co. Ltd (based in Zhangjiakou), Shanghai ABS Technical Inspection Co. Ltd and Mak Kee International H.K.Ltd (based in Hong Kong). All of these companies successfully completed the rigorous assessments, which were undertaken by one of LEEA’s team of technical officers. These audits are ground breaking as they reflect a growing interest in LEEA membership among companies within the Chinese lifting industry. The first step for all companies wishing to gain all membership to the LEEA is a technical audit. This audit covers a variety of issues including the use of appropriately trained staff, the availability of suitable and correctly calibrated test equipment, effective material control, traceability and identification procedures and ensuring that the correct documentation is issued following manufacture, test or inspection. Following the initial audits companies must undergo further periodic audits if they wish to maintain their membership to the association. Over the past few years, an increasing number of companies based across Europe, Africa, Asia, Australasia, and also the Americas have shown interest in LEEA membership and then conformed to the strict entry requirements. The addition of H-Lift Industries, General Lifting Engineering (Skip Lifting), Shnghai ABS Technical Inspection and Mak Kee International to the global membership, which is already in excess of 650, further extends the impressive international presence of LEEA. The association was established in 1944. Upon entry members are provided with access to a wide range of services including training, accreditation and modern technical services. Included within these technical services is the TEAM card registration and identity scheme. This scheme is specifically catered for engineers which have passed the LEEAs industry recognised Diploma examination. 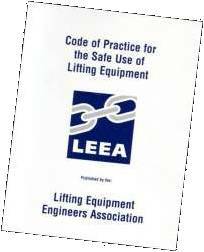 This entry was posted in Handling Equipment and tagged LEEA, Lifting Equipment Engineers Association on September 19, 2013 by admin.